Arthur Taylor is one of the men named on the Bottesford ‘church list’ of WW1 Servicemen. Arthur Henry Taylor was born in October 1899 and baptised on the 26th November 1899 at Bottesford. His parents were Arthur Edward Taylor, born in Bottesford in 1873 in Grantham, and Louisa Butler, who was born in 1874 in Londonthorpe, Grantham. They were married on the 4th October 1897 in St Wulfram’s, Grantham. Arthur Edward Taylor was the second son of a labourer named James Taylor from Derbyshire and his wife Ellen who came from Great Gonerby. They lived in Spittlegate, Grantham. By 1891, his father had become a fellmonger, and he was described as a butcher, aged 17. Louisa’s father Henry was also a butcher. In 1881, his business was in Vine Street, Grantham, where he lived with his wife Elizabeth and daughter Louisa. In 1891, Henry had died and the business was carried on by Elizabeth. Louisa was now 17, and there was a son Harry, aged 8. In 1901, Arthur Edward and Louisa Taylor had set up their butcher’s shop by the Market Cross in Bottesford, where it still is found today. They had three children, three year old Beatrice May, one year old Arthur Henry and baby Sydney Butler. The shop was doing well in 1911, by which date there were two more daughters, Lilian Iris, aged 6, and Ada Marjorie, aged 2. The two boys, Arthur (11) and Sydney (10), were both at school. 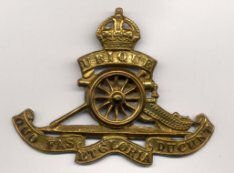 Arthur Taylor enlisted in 1915 and joined the Royal Horse Artillery, service number 110924. He arrived in France on the 13th December, 1915. Because of his butchery skills, he worked with the supply of horses as food. French farm horses were thicker set than british ones, because they were bred for meat. Arthur was known to say that there was nothing better than a fat horse. There was an issue of horses per month. The best, youngest and fattest horses were fed well (“They eat beautiful”), then one a week was slaughtered. At the end of the war, the surviving horses were sold to the French and the Germans. Arthur Taylor was awarded the 1915-Star, British Medal and Victory Medal. After the war, Arthur Henry Taylor returned to the butchery business in the village. He died on the 11th November 1957, and was buried on the 13th November, 1957, aged 57.